I feel terrible about not making an entry about one of the most honored days in American history, D-Day, yesterday. I am limiting myself to one post a day so as not to bore the many (and I especially appreciate certain readers from Warner Robbins, GA and Pompano Beach, FL) readers to this blog. I appreciate you all very much. As I do on each Memorial Day, D-Day and Veteran’s Day, I always watch “Saving Pvt. Ryan.” which brings me to the second point of my blog entry…my Uncle John. Uncle John was among the first wave at Omaha Beach at Normandy. 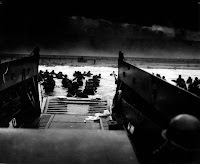 90-95% of the men that were in that first wave were either killed or wounded. Think about that for a moment…90-95%. My Uncle John escaped with just a few scratches and lived to march through Paris as the Allies liberated France (the same France that has always been ungrateful to the USA). I took Uncle John to see the first viewing of Saving Pvt. Ryan at the theater. He said the only thing missing was the tremendous amount of smoke that was on the beach that day. Uncle John won the Silver Star for heroism that day. He single-handedly attacked a German pillbox that was holding up numerous men on the beach. He blew it up with grenades, allowing men to advance up from the beach. He was a hero…he was my damn hero. Uncle John would only rarely allow people to see his Silver Star. I was among the lucky few. He always felt (and I agree with this) the real heroes are buried in France. The men who made the ultimate sacrifice. But, there is no denying the heroism of men like Uncle John. Uncle John passed away in July of 2005 (one of the worst years of my life…divorce, Hurricane Katrina, and Uncle John passing). He always wanted to be buried in France with his fellow soldiers…men who will always be 18, 19, and 20 years old. But, it was not to be as France turned down our family’s request. Uncle John wasn’t eligible because he didn’t die at Normandy. That was so disgusting to me. I don’t know how ungrateful a country can be. We made so many sacrifices for France. They repay us with a slap in the face all the time. I believe it was during the 60’s when Charles de Gaulle ordered all American troops out of France when Secretary of State Dean Rusk asked a classic question. "Does that include the dead Americans in military cemeteries as well?" U.S. Secretary of State Dean Rusk reportedly asked. Secretary Rusk never got an answer to his question. Incidentally, all those graves face westward toward their home, the United States of America. Thanks to all of the “Greatest Generation” for all they did to protect this world from a menace like the world has never known, Adolf Hitler.